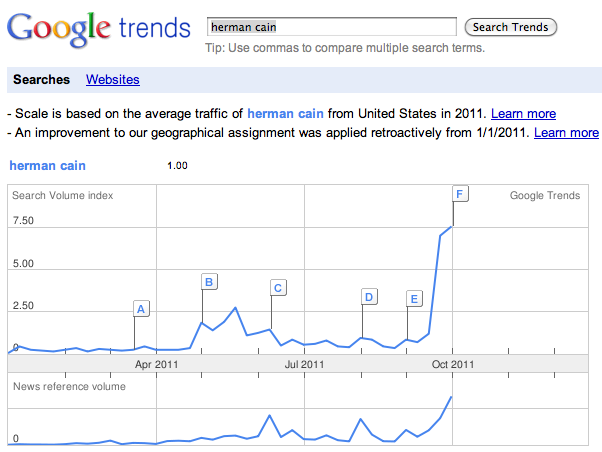 , in all of 2011, Cain is rising fast in Austin, Dallas, Houston, and San Antonio. From an early look at the state of the GOP Presidential race in Iowa to looking at what users were searching for during our Fox News Debate last week, we’ve chronicled what voters are looking for on the web. Having access to useful political and issue information improves our democracy, and the team here at Google is always looking for more ways to help inform voters. We’ll be visiting these type of trends over the next year, but we know that we can’t possibly spot them all. That’s why, we’re looking to you - the user - to help us find and discover interesting patterns and trends in search data. Over the past decade, the web has consistently shown that it can help transform politics and elections from a passive process to an active, participatory one. Thousands of voters from all walks of life are using the web to stand up for a candidate or an issue and Google has begun to build tools to help voters find and share valuable information and create knowledge around issues. But, we need your help to tell that story. We’ve demonstrated in the past that these trends often can make compelling cases on campaigns and election outcomes, but there’s more data that we can sift through ourselves. Data is at the heart of much of what we do here at Google and we’re not the only ones who get excited about how data can be visualized in a compelling way. Gregory Hubacek from Good Magazine created this beautiful visualization of the data around our debate last month. This infographic and timeline show how the debate evolved over the course of the evening. 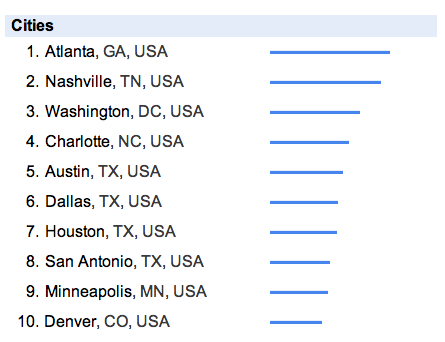 So, go get busy researching trends and insights via our tools and submit them today. We’ll feature as many of them as we can. In the meantime, stay tuned to the Politics & Elections Blog for trends and other data that can help frame up issues, races, and campaigns. November of 2012 will be here before you think!